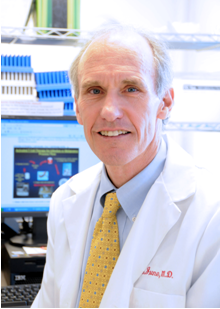 Carl June is the Richard W. Vague Professor in Immunotherapy in the Department of Pathology and Laboratory Medicine. He is currently Director of Translational Research at the Abramson Cancer Center at the University of Pennsylvania, and is an Investigator of the Abramson Family Cancer Research Institute. He is a graduate of the Naval Academy in Annapolis, and Baylor College of Medicine in Houston, 1979. He had graduate training in Immunology and malaria with Dr. Paul-Henri Lambert at the World Health Organization, Geneva, Switzerland from 1978-79, and post-doctoral training in transplantation biology with Dr. E. Donnell Thomas and Dr. John Hansen at the Fred Hutchinson Cancer Research Center in Seattle from 1983 - 1986. He is board certified in Internal Medicine and Medical Oncology. He founded the Immune Cell Biology Program and was head of the Department of Immunology at the Naval Medical Research Institute from 1990 to 1995 before joining the faculty of the Perelman School of Medicine in 1999. He maintains a research laboratory that studies various mechanisms of lymphocyte activation that relate to immune tolerance and adoptive immunotherapy for cancer and chronic infection. To apply principles of the cellular immune system to develop novel therapies for cancer and chronic infection. We focus on the human immune system and study the biology of lymphocytes in order to manipulate their function and development, and then apply this knowledge for potential new avenues of immunotherapy. For several years we have been interested in the notion that various costimulatory molecules might have a role in specifying the fate of various lymphocyte subsets. Current projects are studying the role of CD28 and TNF family members in lymphocyte function and proliferation. Other projects involve developing advanced technology to engineer lymphocytes subsets for enhanced therapeutic effector functions. A variety of in vitro assays and humanized mouse models are used to discover new approaches and test for potential therapeutic activity.